This is VERY cool – TMF is one of the Quality Improvement Organizations/Quality Innovation Networks who work with healthcare stakeholders to improve the quality of healthcare. TMF, like other QIO/QINs is contracted to CMS for healthcare quality innovation projects. We encourage everyone to participate in this outstanding initiative to advance the EMS profession, and the EMS transformation! Austin, Texas – TMF Health Quality Institute in partnership with the National Association of Emergency Medical Technicians (NAEMT) announces the release of an online learning and collaboration platform aimed at increasing awareness and improving the efficiency of Mobile Integrated Healthcare–Community Paramedicine (MIH-CP) programs. MIH-CP is an innovative health care delivery strategy that uses experienced EMTs, paramedics and nurses in non-traditional roles, aimed at improving a patient’s care experiences, improving the health of the population at large, and reducing the per capita cost of health care. MIH-CP practitioners use their skills and experience to provide high quality care in preventive roles, maximizing the use of available health care and community resources. The web-based MIH-CP Learning and Action Network (LAN) features several components, including data analytics support for MIH-CP programs, a knowledge network, several educational offerings such as monthly webinars focused on a variety of MIH-CP audiences, discussion boards and MIH-CP Program Profiles. The LAN at https://mihcp.tmf.org will soon also feature a searchable database of existing U.S.-based MIH-CP programs, affinity groups and a Help Desk, which will give MIH-CP stakeholders a resource to request assistance with program development and facilitation questions. TMF Health Quality Institute focuses on improving lives by improving the quality of health care through contracts with federal, state and local governments, as well as private organizations. For more than 45 years, TMF has helped health care providers and practitioners in a variety of settings improve care for their patients. Interesting comments from Sec. Azar, especially with the recent pace of activity from CMS and CMMI conducting conference calls with several EMS organization, requesting SOPs, protocols, outcome measures and ROI determinations for things like Ambulance Transport Alternatives, Community Paramedicine and 9-1-1 Nurse Triage. Even interviewing current payers who are paying EMS agencies for these transformational services. Atrium Medical Center is partnering with the local fire department to launch a telehealth service aimed at local residents who frequently dial 911. The community paramedicine program is one of hundreds popping up across the country. An Ohio hospital is partnering with the local fire department and Miami University Oxford to launch a telehealth program aimed at the most frequent users of the 911 emergency system. Middletown-based Atrium Medical Center and the Monroe Fire Department are launching a community paramedicine pilot program in the southwest Ohio community, with the goal of bringing connected health services to the region’s most frail and homebound residents. Also known as Mobile Integrated Health, the community paramedicine program involves sending healthcare providers – usually paramedics – on scheduled visits to the homes of people who most often call 911. The paramedics perform health and wellness checks using telemedicine equipment, check out the home for potential health hazards and educate residents on community health resources. Atrium officials say the program aims not only to reduce unnecessary ambulance calls and ER visits, but to improve the health and wellness of residents who have problems accessing regular healthcare services. As part of the program, Miami University students in social work programs will participate in the visits to chart their effectiveness. And the teams will carry a telemedicine kit developed by HNC Virtual Solutions. As of mid-2017, some 260 EMS programs across the country were using some sort of community paramedicine program, up from 100 programs in 2014, according to the National Association of Emergency Medical Technicians. “Having the opportunity to work with patients in the homes or work sites gives us the chance to be proactive instead of reactive,” Amie Allison, EMS Director for Montana’s Glacier County, said when the Glacier County Community Health Center launched its first-in-the state Integrated Mobile Health Service Program in early 2017. Earlier this year in New Mexico, American Medical Response unveiled its Mobile Integrated Healthcare (MIH) program in Valencia County following talks with Blue Cross Blue Shield of New Mexico and Molina Healthcare, which will be funding the program for its members. In Milwaukee, meanwhile, a program launched in 2015 by the Milwaukee Fire Department has reduced 911 calls from so-called “frequent flyers” by more than 50 percent over the past two years. One variation of the service, Houston’s Project Ethan (Emergency TeleHealth And Navigation), launched in 2014, sends first responders with telehealth equipment to the scene of a 911 call to assess the caller before deciding on transport. 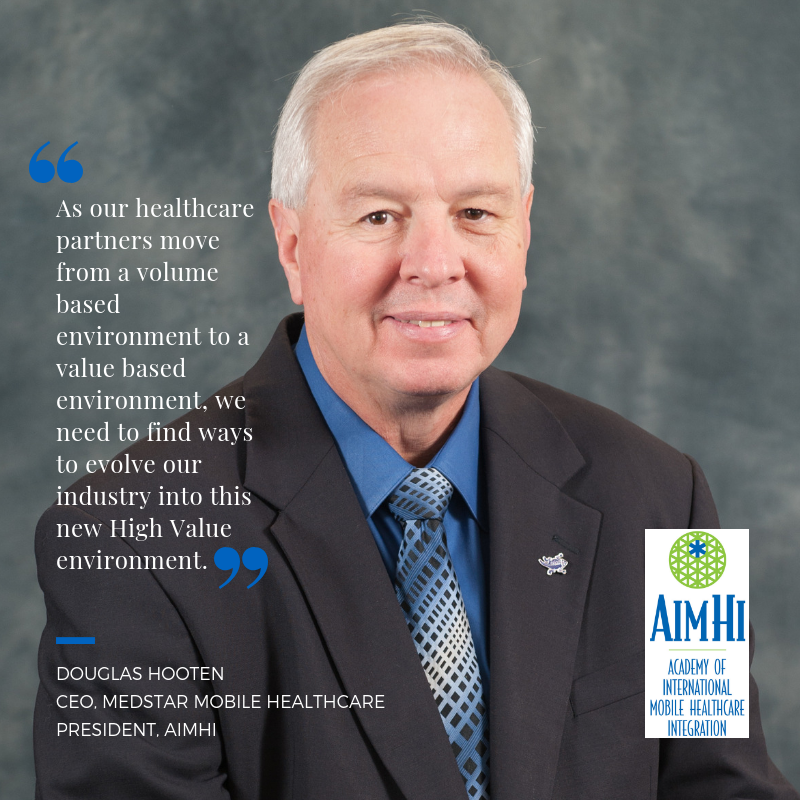 Learn what high performance, high value EMS means to MedStar Mobile Healthcare CEO and AIMHI President Doug Hooten. 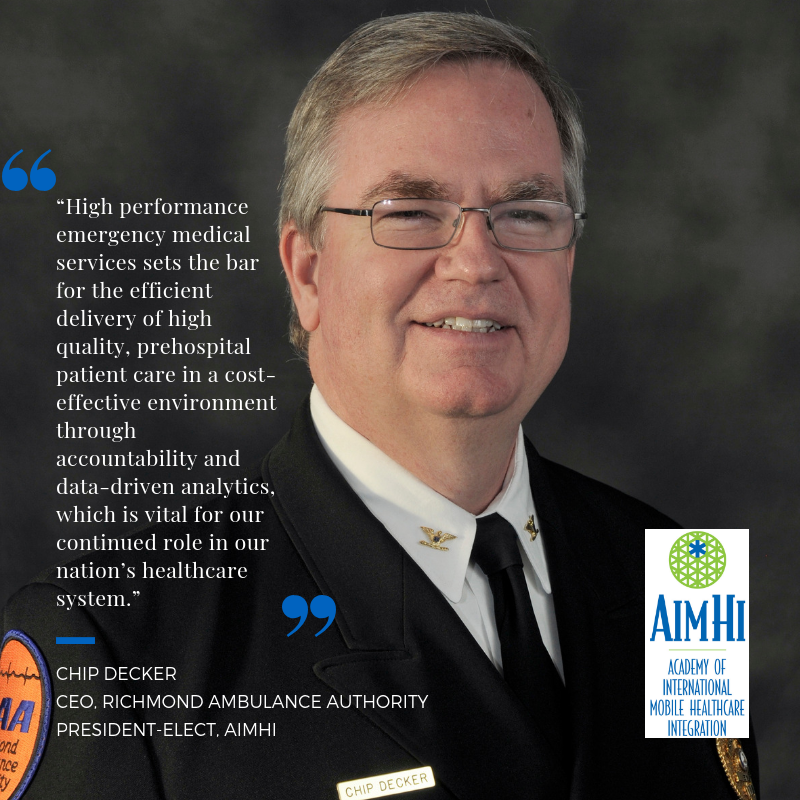 Learn what high performance EMS means to AIMHI President-Elect Chip Decker of Richmond Ambulance Authority.